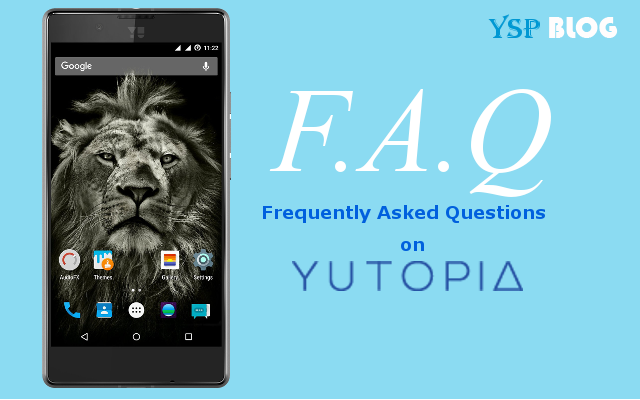 This post contains frequently asked questions about the YU Yutopia. The FAQs have been based on the questions we have been asked on our Facebook Page and the general queries related to the device. If the answer you're looking for is not available here, please leave a comment here or on our FB Page or email us at info@yurekasupport.com. Important Question : What's the price of YU Yutopia? Answer : YU Yutopia is originally priced at ₹29,999, however for a limited period of time it is available at ₹24,999 only exclusively at Amzon India. It also comes with a range of launch offers read more details regarding the same here: YU Yutopia Launch Offers. 1. Where can I get the YU Yutopia (YU5050)? Ans : YU Yutopia (model no: YU5050) is exclusively available on Amazon India. You can purchase Yutopia directly at the following link: YU Yutopia on Amzon India. 2. How long would it take the phone to be delivered? 3. How do I return a defective product? 4. What are the modes of payment? Or, Is COD (cash on delivery) available on Yutopia? 5. Is EMI option available on Yutopia? Ans : Screen size is 5.2" QHD (2560x1440) display. Pixel density is 565 ppi. Ans : Yes, it comes with Corning Concore Glass. Ans : Qualcomm® Snapdragon 810 (MSM8994) processor Quad-core 2.0 GHz Cortex A57 + quad-core 1.5 GHz Cortex-A53 and Adreno 405 GPU. Ans : It has DDR3 4GB RAM. After the boot approx 2.0 GB is available. Ans : ROM or internal storage is 32 GB. Around 24 GB is available for apps and mass storage. Ans : Yes, it supports up to 128 GB external SD Card. Yes, move to SD card option is available. 8. Does Yutopia support USB OTG? Ans : Yes. It does. Ans : Yes. It will support 2G, 3G as well as 4G SIM Card. 12. Tell us about the battery in Yutopa. Is it removable? Ans : It has 3,000 mAh non-removable battery. 13. What's the weight of the Yutopia? 1. Tell us about the camera in Yutopia. 1. What is the warranty on YU Yutopia? 2. Where would I go to repair my phone? Where is YU Yutopia service center? Ans : You can either go to the one of 800+ service centres of YU or you can choose for doorstep service by YU.